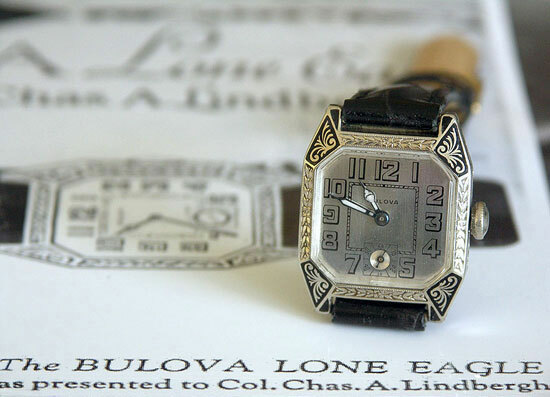 The Bulova 'Lone Eagle' watch was officially released on June 17, 1927. In 1926 Ardé Bulova, son of Joseph Bulova, offered the prize of $1,000 to the first pilot to successfully make a nonstop flight across the Atlantic. A simialar prize for $25,000 was also offered by Raymond Orteig. 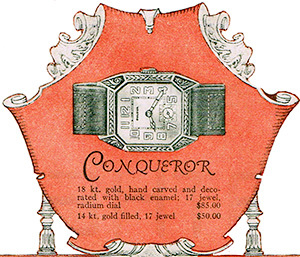 In 1925-26, Bulova had a particular watch model known as the ‘Conqueror’ and possibly saw the potential for the worlds first 'commemorative watch to mark the occasion. The name was a fitting title for the pilot/s who would make the daring flight. In the Sayville (NY) Suffolk County News of May 2nd, 1930 a Mr H.H Taub of Bulova stated that "his company gave every aviator who attempted to hop the ocean a watch". It has been my belief since 2006 that this watch was a Bulova Conqueror. In the article Mr Taub states that "the watch was one of the hardest sellers in the company's line". 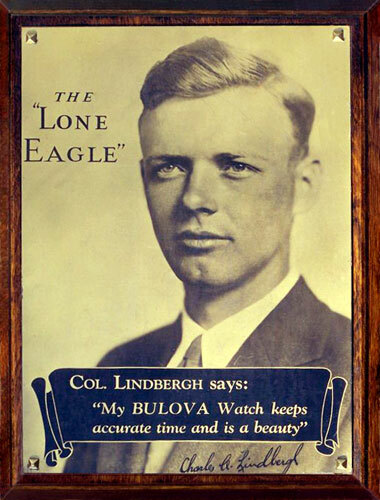 Yet within 48 hours of Lindbergh's landing in Paris, Bulova received orders totalling 30,000 (according to the article) for the watch that would become the "Bulova Lone Eagle". Bulova's own history books tell us that the company 'sold' 5000 of these watches within 3 days after the landing. I believe that Mr Taubs statement about orders totaling 30,000 certainly explains how Bulova achieved this remarkable sales feat. It's also my belief that the word 'sold' does not refer to 'sold to the public' but rather pre-sales orders to thier authorised resellers across the country, totaling 30,000. This potentially left Bulova with a massive shortfall in fulfilling the remaining orders and further goes to possibly explain the intense marketing campaign and subsequent release of another batch of Lone Eagle watches so soon after the first, at around August of 1927. 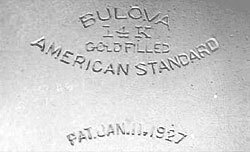 Through approximately 6 years of research with members of the myBulova.com community, we have established a timeline of events and advertisements that followed the historic flight of May 1927. 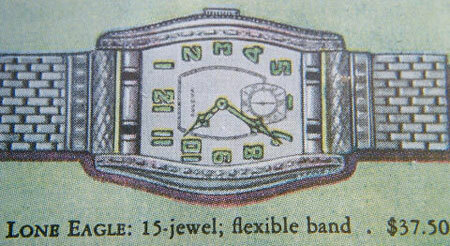 27 June 1927 Huff's Jewelry store advert "watch presented to..."
15 July 1927 H.A Tibbals advert "replica of the watch worn by...."
The timeline still has a number of gaps with the period between May 21 and June 6 1927 being of greatest interest. 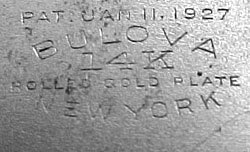 It is my hope and that of a number of myBulova.com members that we will one day unearth this information to complete this historical story. 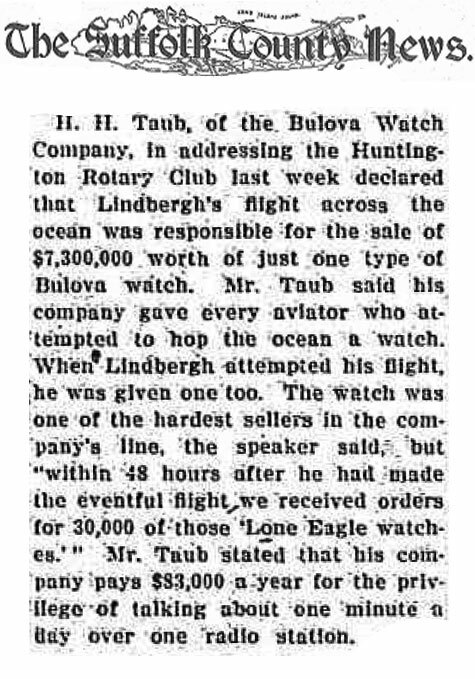 One fact that has now come to light with Mr Taubs statement above is that Charles Lindbergh was given at least two Bulova watches during this period. 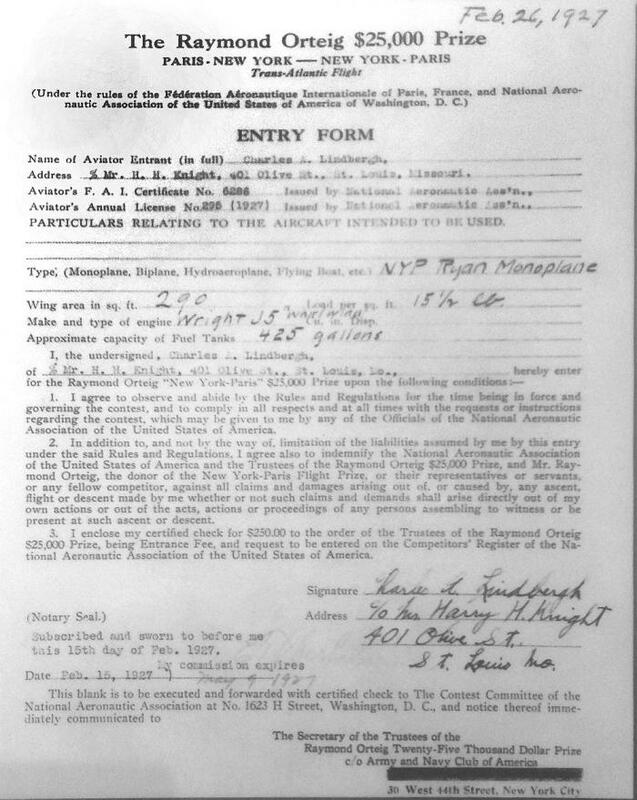 The Conqueror pre flight and the presentation piece upon his return to the US. We also see a number of articles stating that Lindbergh wore the Conqueror during his flight, but we have yet to see any hard evidence to confirm this. 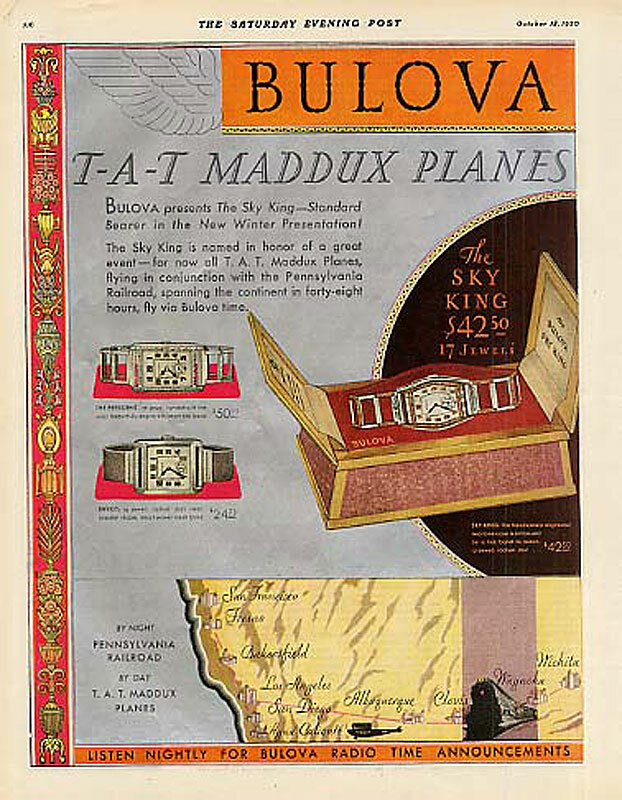 My theory goes that Bulova having offered the $1000 prize money in 1926 were well aware that one day someone would eventually make the historic flight and saw a wonderful marketing opportunity to capitalise on the event by selling a commemorative watch. They helped to ensure this by giving a number of pilots who had registered for the Raymond Orteig-$25,000 prize, a Bulova watch (the Conqueror). 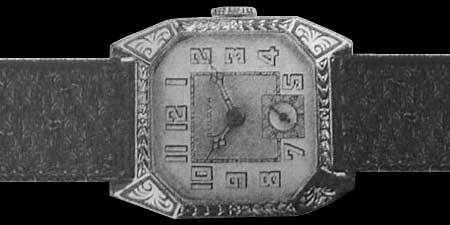 Bulova may have been an emerging watch company but I believe that they were ahead of the game during this period when it came to marketing, you only have to look at their adverts from the 1920’s compared to the competition and their use of radio advertising the B-U-L-O-V-A time. I believe that along with the prize money offered they ordered and stock piled a number of cases and movements in preparation for the day someone was successful. 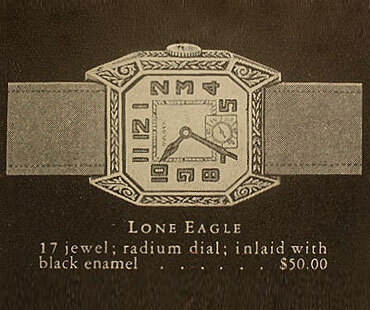 My belief is that they never intended the watch to be called the “Lone Eagle” until after Lindbergh made the flight. This is were I believe their original choice in watch came into play....’the ‘Conqueror’, a fitting name for the pilot/s who would make the daring flight. Again it is my belief that Bulova having prepared for this event (regardless of who it was that made it) would be ready to get the watches out to the public before anyone else. It’s also my belief that Bulova played their cards close to their chest when deciding to finally call the watch the “Lone Eagle”. The fact that they filed for use of the name on the 17th of June 1927 and immediately the same day hit the market with adverts using the Lone Eagle name with box and letter, shows categorically that they had been busy between May 22 and June 17 (a total of 26 days) preparing for the release. For those that think Bulova didn’t pre-plan this in advanced are incorrect as there is no way any company could go to market in this fashion with only 26 days preparation. They had to have had a stock pile of watches and boxes ready to go. They would have used the 26 days to prepare the watches, boxes and copy of the letter. It makes perfect sense that Bulova wouldn’t use the name in any advertising until they had secured the naming rights for the watch. This explains why we still see the ‘Conqueror’ being sold right up until the time the Lone Eagle was released. 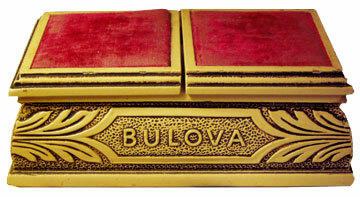 Logic dictates that Bulova had the stock in waiting and capitalised on this event in a great way by doing so. 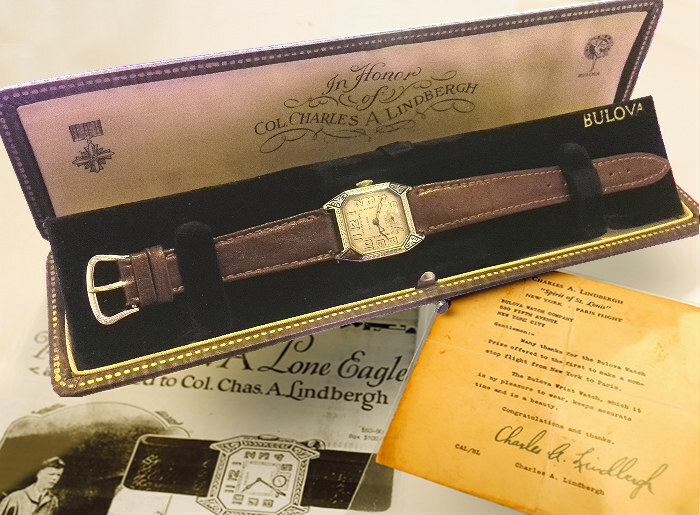 A number of years ago I was contacted by a Mr Gorden Bell of Texas, who claimed to have in his possession the actual Bulova watch presented to Charles Lindbergh by Ardé Bulova aboard the USS Memphis. His amazing story can be read here. How did Bulova get the word out to the jewelers across the country in order to receive 30,000 orders within 48 hours after the landing? Does Bulova's statement about the watch selling out in 3 days actually relate to pre-orders only or actual sales? Was the official letter of thanks from Lindbergh to Bulova for the Conqueror or the presentation piece? There is evidence that shows that a short telegram of thanks was sent to Bulova when Lindbergh was aboard the USS Memphis, this message would be for the presentation piece. When I first wrote this article back in 2006 it was my belief that Bulova must have had a major marketing campaign to sell the 5000 in three days. 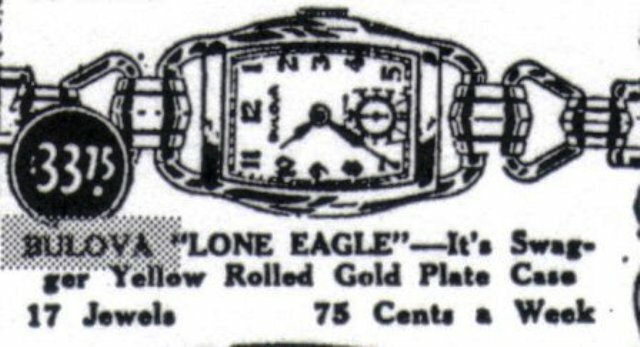 It's now my belief that the marketing of the Lone Eagle series didn't take place until June 17 1927, the same day Bulova filed a trademark for 'Lone Eagle' in relation to watches. 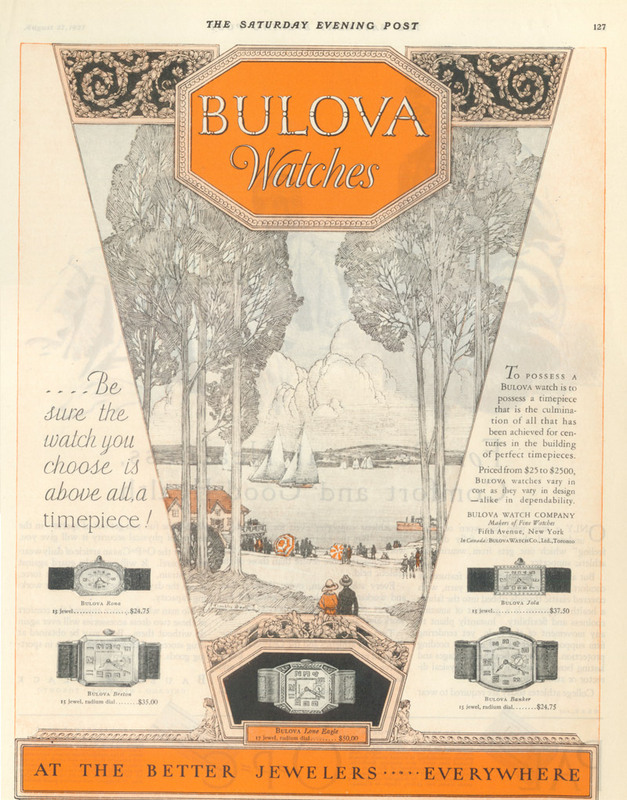 To some extent my "holy grail" search has ended, but my search still continues for early June 1927 adverts, in-particular Bulova's first official advert, if not this one. If this story strikes an interest in you and you wish to help us on our quest to find the missing pieces of the puzzle then please come and join us. The more eyes we have scouring the web, libraries and print articles the better. The two ads below show how Bulova advertised both the 1926 Conqueror and the 1927/28 Lone Eagle. The designs are exactly the same, yet all the Lone Eagle watches we have on record and in many watch price guide books have a different corner design. 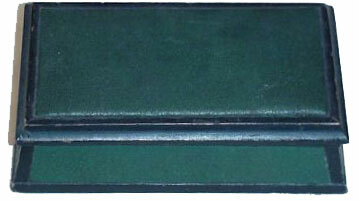 There is a belief that the design shown in the adverts was only used on the 18kt. solid gold models of which are very rare. 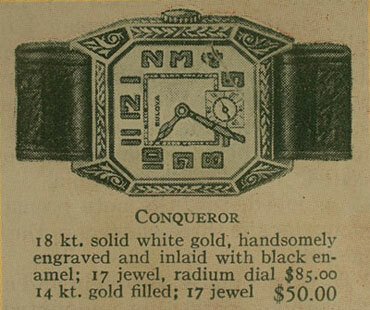 This is the Conqueror/Lone Eagle design we see in all vintage Bulova watch adverts. 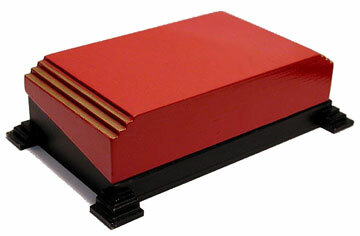 This is the common design as seen on all popular Lone Eagle sales and literature. 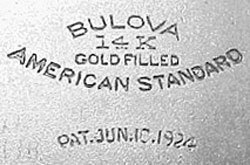 What we can see from the 1927/28 Bulova Lone Eagle watch ads is that Bulova did not change the print used from the Conqueror ads, but instead continued to run the same ones. 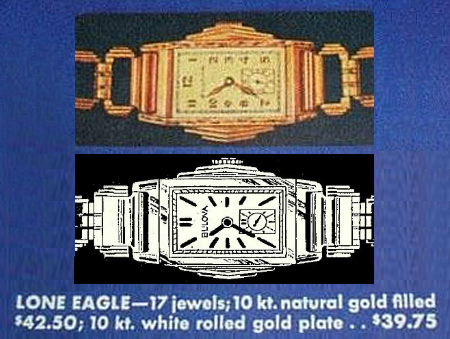 At what point Bulova decided to vary the corner design to resemble that of an Art Deco style eagles head (the bottom design) is unknown, but in my opinion the design used ended up being a fitting representation for the 'Lone Eagle', as Lindbergh was so named. The back case markings of the first releases of the corner-cut Lone Eagles were all stamped with the Patent date of Jun 10 1924, were as later releases (post August 1927) were stamped with the Patent date of Jan 11 1927. 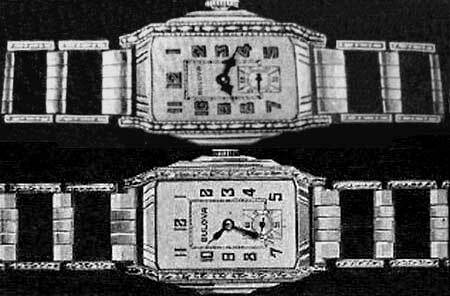 The Bulova history book writes that once the original 5000 sold out in just three days (22 May 1927 - 24 May 1927) they went on to sell more of this corner-cut design throughout the remainder of 1927 and into 1928. However later corner-cut editions (post original 5000) changed the dial and hands to use a closed 9 instead of an open 9 and cathedral hands instead of the spade style hands. The cathedral hands became a common feature in most 1928/29 and 30's Bulova mens watches. Below you can see a listing of Lone Eagle watches currently entered in to the myBulova.com database (remember that this is the worlds largest recording of Lone Eagle watches). Whilst other sites claim that Bulova's historic account of 5000 is incorrect, the listing below clearly shows it to to be highly possible, with the movement serial numbers we have recorded (so far) being within a 5000 range. Remember the 30,000 mentioned previously was only the post flight 'ordered' number and not what was originally produced for the marketing of this event. From 1928 onwards a number of other 'confirmed' variant models were release. There is a common misconception that the Bulova Sky King is also part of this series which honors Charles Lindbergh, but is in fact named in honor of T.A.T. Maddux Planes being fitted with Bulova timepieces in 1930. There are four box styles that I know of for this watch series. These boxes clearly indicate on the inside that the watch is dedicated in honour of Charles A Lindbergh. As I discover more about this series of watches I'll post here. You can view a number of Lone Eagle and other Bulova watches on the myBulova.com website and I invite all Bulova watch owners to add their watch to this site as a reference for future collectors. 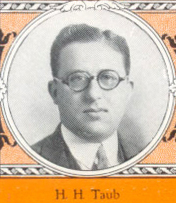 Additional information can be found in the 1927 Bulova Lone Eagle forum. I invite everyone who reads this article to let me know if they have a different point of view and especially if they have factual information about the release and marketing of the original 5000 Bulova Lone Eagles in 1927. Article originally written by Stephen Ollman in 2006 and updated in September 2014. I would like to personally thank William Smith, Robert Butler, Lisa Lawrence Andrew and a host of other myBulova.com members that have helped compile this information.